More than 50 years after it opened in 1964, Tiber Island stands as a tribute to the idealism that marked the new Southwest. Planners hoped the neighborhood's mid-20th-century modern architecture, mix of high- and low-rise structures, balance of intimacy and communal areas, lush landscaping, and magnificent views would draw middle-class families back to the city. 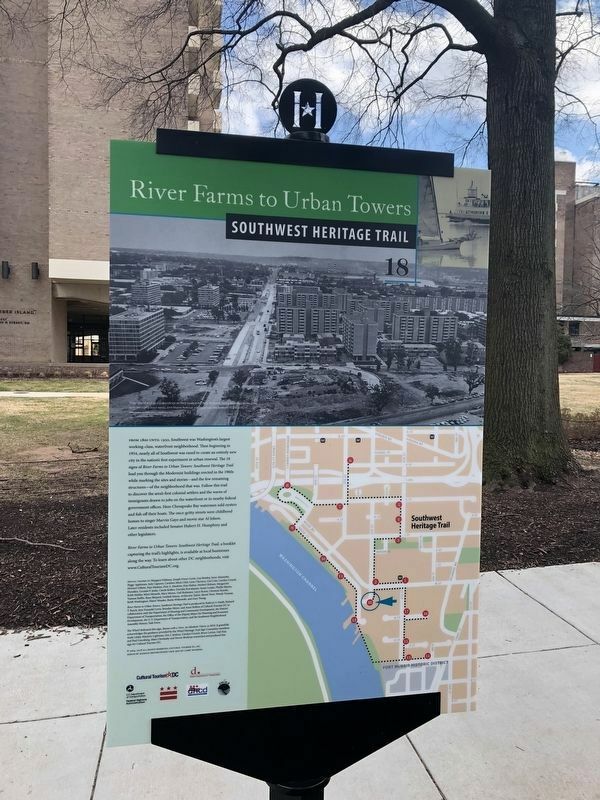 For Tiber Island, the DC Redevelopment Land Agency (RLA) tried something different: a design competition. The local firm Keyes, Lethbridge & Condon's winning entry featured structurally expressive modern architecture: a pre-stressed-concrete "frame" with brick infill. Each apartment building appears to float over the all-glass lobby separating the exterior public space from the private central courtyard. Rowhouses stand at each corner of the property. visibility, the incident received significant attention. In November 1962, President John F. Kennedy signed an executive order prohibiting discrimination in federally supported housing—such as here in the Southwest Urban Renewal Area. 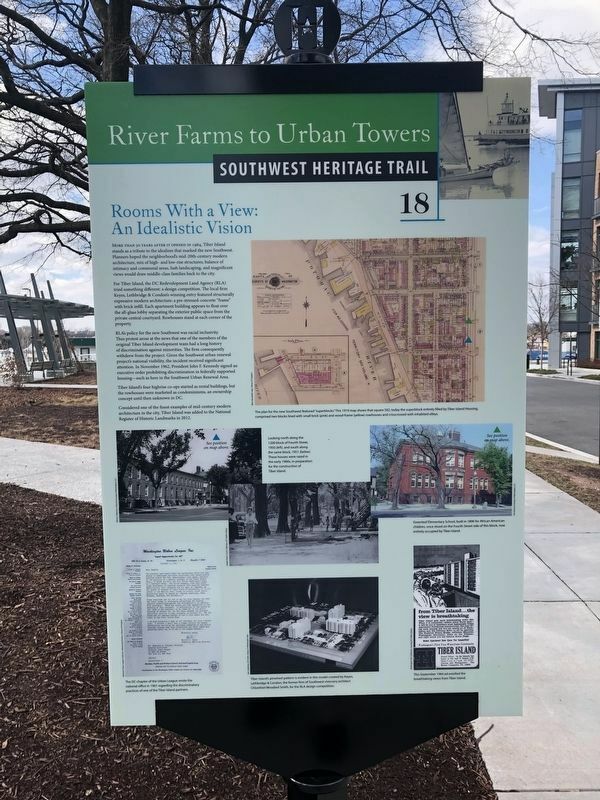 Tiber Island's four highrise co-ops started as rental building, but the rowhouses were marketed as condominiums, an ownership concept until then unknown in DC. Considered one of the finest examples of mid-century modern architecture in the city, Tiber Island was added to the National Register of Historic Landmarks in 2012. Location. 38° 52.54′ N, 77° 1.209′ W. Marker is in Southwest, District of Columbia, in Washington. Marker is on 6th Street Southwest east of Water Street Southwest, on the right when traveling east. Touch for map. Marker is at or near this postal address: 525 Water Street Southwest, Washington DC 20024, United States of America. Touch for directions. All Aboard! (about 700 feet away); Lewis House (about 700 feet away); Change on the Waterfront (approx. 0.2 miles away); Blending Old and New (approx. 0.2 miles away); Wheat Row (approx. 0.2 miles away). Touch for a list and map of all markers in Southwest. More. Search the internet for Rooms With a View: An Idealistic Vision. Credits. This page was last revised on March 17, 2019. This page originally submitted on March 4, 2019, by Devry Becker Jones of Washington, District of Columbia. This page has been viewed 30 times since then. 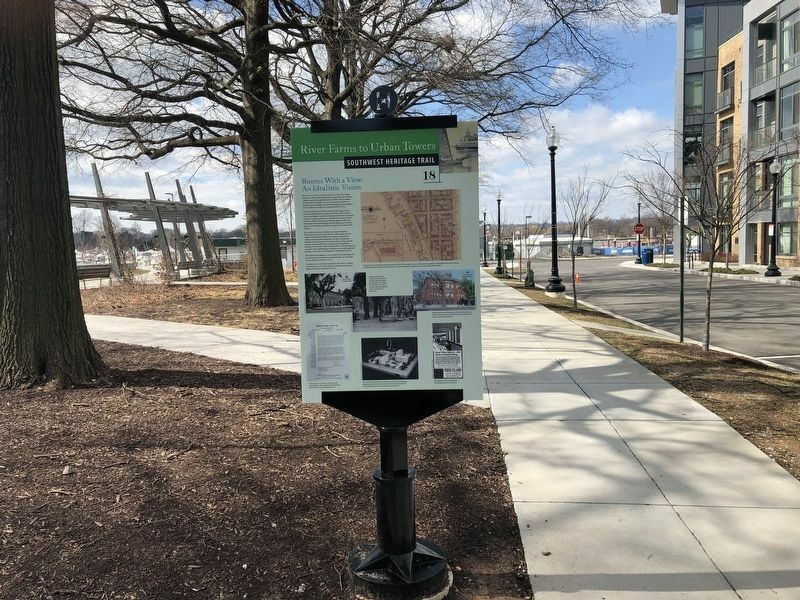 Photos: 1, 2, 3. submitted on March 4, 2019, by Devry Becker Jones of Washington, District of Columbia. • Andrew Ruppenstein was the editor who published this page.